From America’s preeminent columnist, named by the Financial Timesthe most influential commentator in the nation, the long-awaited collection of Charles Krauthammer’s essential, timeless writings. A brilliant stylist known for an uncompromising honesty that challenges conventional wisdom at every turn, Krauthammer has for decades daz­zled readers with his keen insight into politics and government. His weekly column is a must-read in Washington and across the country. Now, finally, the best of Krauthammer’s intelligence, erudition and wit are collected in one volume. Readers will find here not only the country’s leading conservative thinker offering a pas­sionate defense of limited government, but also a highly independent mind whose views—on feminism, evolution and the death penalty, for example—defy ideological convention. 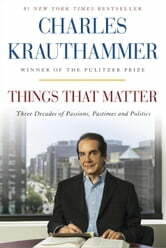 Things That Matter also features several of Krautham­mer’s major path-breaking essays—on bioeth­ics, on Jewish destiny and on America’s role as the world’s superpower—that have pro­foundly influenced the nation’s thoughts and policies. And finally, the collection presents a trove of always penetrating, often bemused re­flections on everything from border collies to Halley’s Comet, from Woody Allen to Win­ston Churchill, from the punishing pleasures of speed chess to the elegance of the perfectly thrown outfield assist. 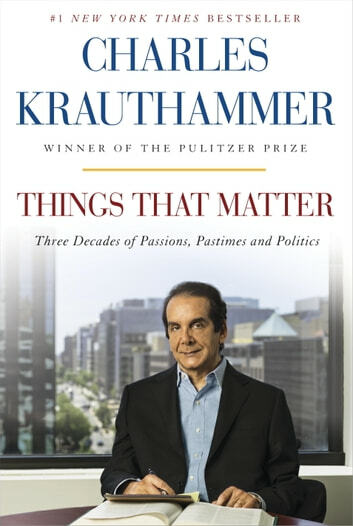 With a special, highly autobiographical in­troduction in which Krauthammer reflects on the events that shaped his career and political philosophy, this indispensible chronicle takes the reader on a fascinating journey through the fashions and follies, the tragedies and triumphs, of the last three decades of American life. Brilliant, thought provoking, and entertaining. A great investment of time. Should be a prerequisite to vote. Good read s lot of interesting subjects but some are boring or too long. This man has an uncanny way of analyzing world politics and always coming to the correct conclusions. He should run for President or at the very least be the Chief of Staff. Krauthammer's 2009 observations on the import of Obama liberal policy are now historical and cannot be impeached. Awesome read. The only political philosopher that parallels the intelect, humor, knowledge of English, of William F. Buckley. I happened on Charles one night watching Fox and immediately thought this guy is worth watching. Soon I had completely rearranged my evening to include his presence. A real gift to humanity.